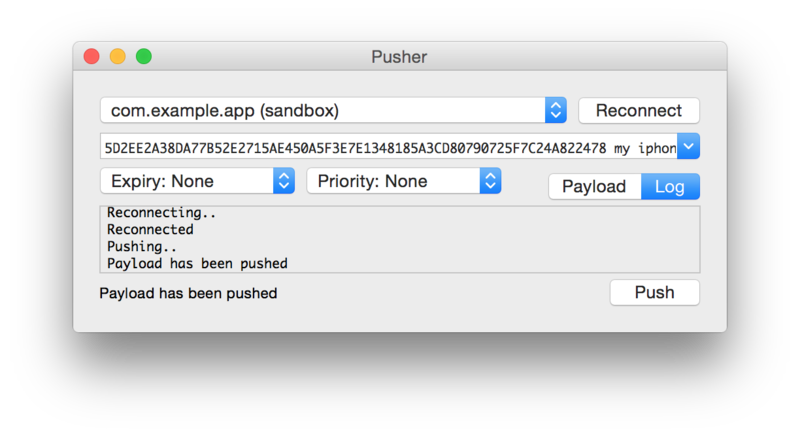 Browse: Home / NWPusher v-0.6.2 released : OS X and iOS application and framework to play with the Apple Push Notification service (APNs). 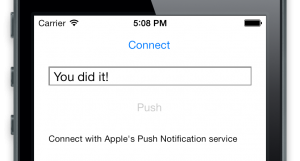 Testing push notifications for your iOS or Mac app can be a pain. You might consider setting up your own server or use one of the many push webservices online. Either way it’s a lot of work to get all these systems connected properly. When it is all working properly, push notifications come in fast (< 1 sec) and reliably. However when nothing comes in, it can be very hard to find out why. That’s why I made Pusher. It is a Mac and iPhone app for sending push notifications directly to the Apple Push Notification Service. No need to set up a server or create an account online. You only need the SSL certificate and a device token to start pushing directly from your Mac, or even from an iPhone! 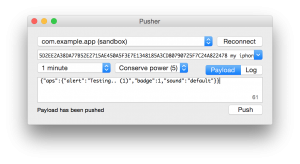 Pusher has detailed error reporting and logs, which are very helpful with verifying your setup. 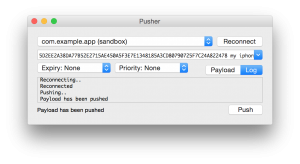 Pusher comes with a small framework for both OS X and iOS. It provides various tools for sending notifications programmatically. 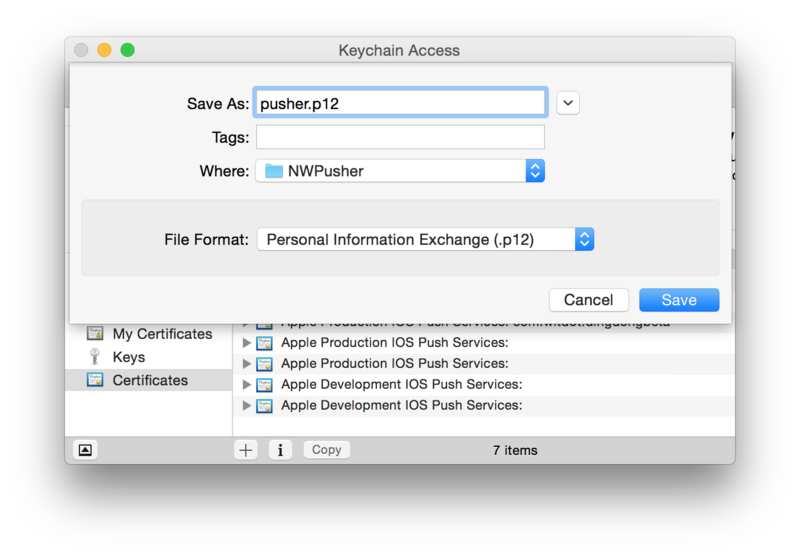 On OS X it can use the keychain to retrieve push certificates and keys. 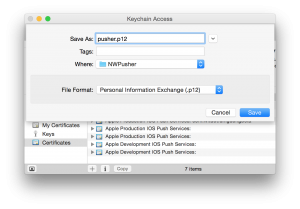 Pusher can also be used without keychain, using a PKCS #12 file. If you want to get a better understanding of how push notifications work, then this framework is a good place to start and play around. Before you can start sending push notification payloads, there are a few hurdles to take. 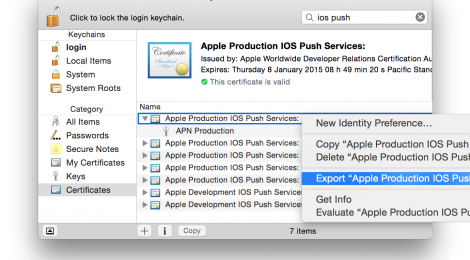 First you’ll need to obtain the Apple Push Services SSL Certificate of the app you want to send notifications to. 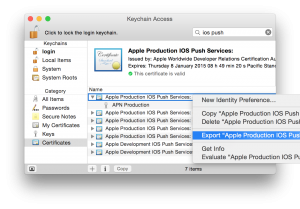 This certificate is used by Pusher to set up the SSL connection through which the payloads will be sent to Apple. 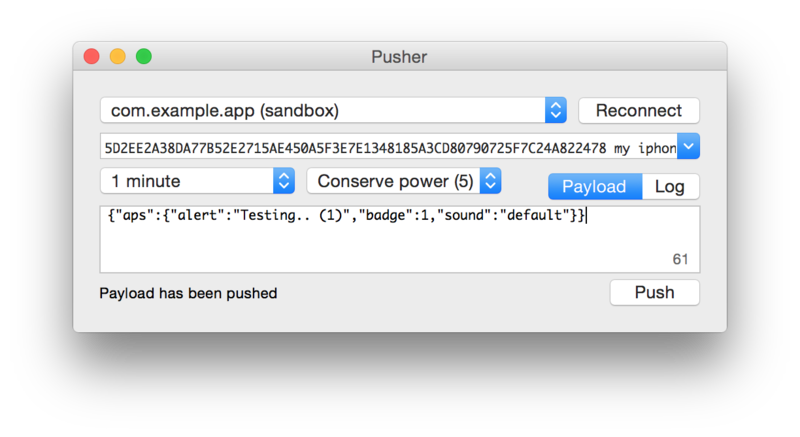 Second you’ll need the device token of the device you want to send your payload to. Every device has its own unique token that can only be obtained from within the app. It’s a bit complicated, but in the end it all comes down to just a few clicks on Apple’s Dev Center website, some gray hairs, and a bit of patience. – From here on you will be guided through the certificate generation process. NB: There is Development and Production certificates, which should (generally) correspond to respectively DEBUG and RELEASE versions of your app. Make sure you get the right one, check Development (sandbox) or Production, iOS or Mac, and the bundle identifier. The combo box at the top lists the available SSL certificates in the keychain. Select the certificate you want to use and paste the device token of the device you’re pushing to. The text field below shows the JSON formatted payload text that you’re sending. Read more about this format in the Apple documentation under Apple Push Notification Service. Now before you press Push, make sure the application you’re sending to is in the background, e.g. by pressing the home button. This way you’re sure the app is not going to interfere with the message, yet. Press push, wait a few seconds, and see the notification coming in. If things are not working as expected, then take a look at the Troubleshooting section below. If everything is set up correctly, you only need to Connect and Push. Then you should receive the Testing.. push message on the device. Again, if things are not working as expected, take a look at the Troubleshooting section below or post an issue on GitHub. ← MISP v-v2.3.39 released – Malware Information Sharing Platform.